I swear, we can't decide which holiday brings out stupid the worst in people. Memorial Day or 4th of July? Probably the 4th but THIS Memorial Day weekend was a banner one. Can I give out local Darwin Awards I wonder? And you are wondering what the heck I'm talking about. Gene, as you know, is the volunteer Fire Chief of the Greensprings Fire and Rescue so it was not unusual for him to get called out for an emergency on a Saturday night on a holiday weekend but these were spectacular calls in their own right. Call #1 was a drunk asshat 4 wheeling on a back road off of a back road in East Bum...you get the idea. 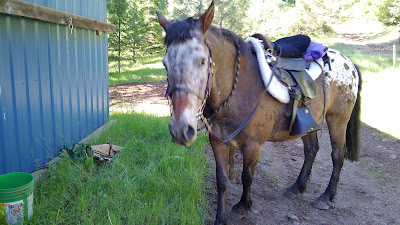 He went over a 20+ foot cliff and was so far out in the wilderness that they had to rope and winch him out. No copter could get in there and it was after midnight. One of volunteers went down with the ambulance. Gene had to go to town to retrieve him. They were returning when call #2 came in from the Howard Prairie camp ground. Seems two couples were camping together, the guys got drunk and then into a fight and then the one drunk decided to take the other's truck and run him over. Sadly he ended up running over his own dog instead and killed it. The state police showed up in force, the other drunk had been hit also, someone was waving guns around, you get the idea. Gene arrived home about 4 in the morning and then we had to deal with my dead LG phone later in the day. We were tired and grumpy and that's about all I want to say about Sunday. I got a new phone (angst over getting it to speak to my Mac computer), but the day finally ended and we both got a good nights sleep. Thank god! Monday was much more fun and productive. 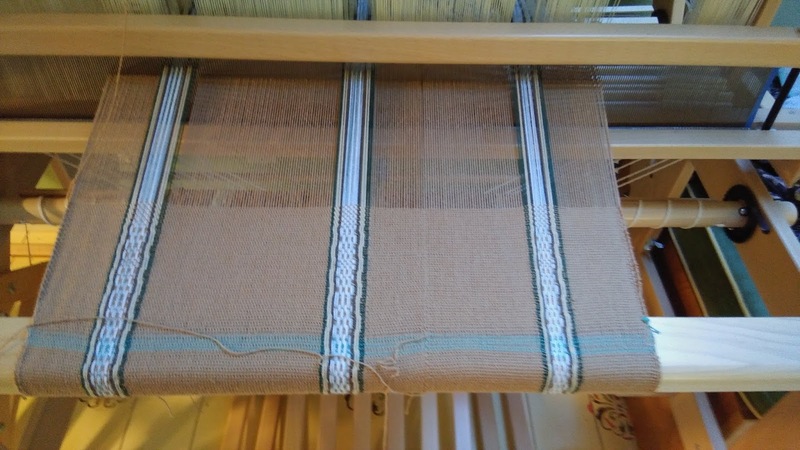 I started weaving on the Ziva David warp. 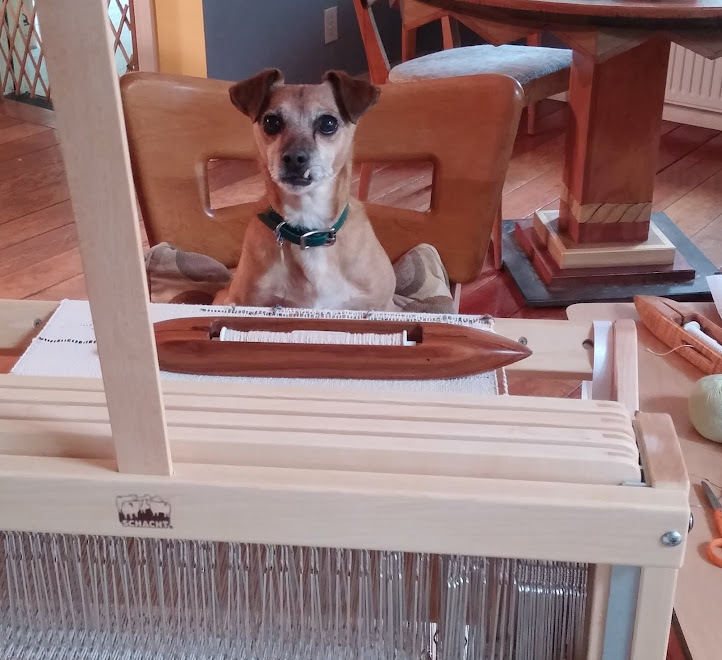 There was one threading error and it was a quick fix with a made up heddle and a hanging bit of yarn added. 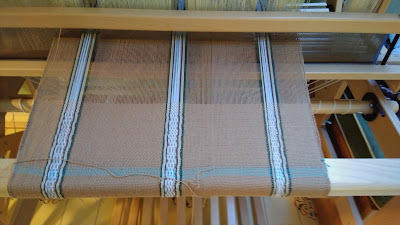 Another warp went on Buttercup easily and is being threaded today. 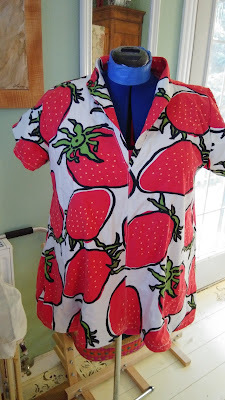 I also managed to finish up another Teddy tunic. Remember this fabric? It started life as curtains, became a little throw and now finally has morphed into it's final form. I do LOVE this graphic print. I have looked high and low for years for another piece of this fabric to no avail. And this morning was so beautiful and perfect I got my fat little 22 year old pony out for his first spin in 2018.
Cooper was typical Cooper, alert but easy going. He had a couple of skin twitches, a little goose, but nothing big. The dang goats accompanied us the whole way. They were panting and lagging by the time we got back. Dandy had been left alone quietly munching on some hay. 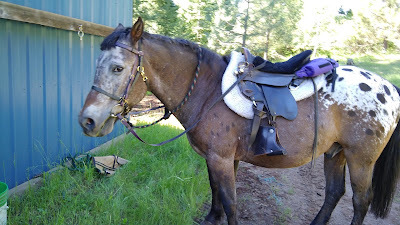 My spotty guy remembered all his voice commands, neck reining and such and was only a little sticky on turn on the haunch. And here's a song to sooth and honor the wild things. Parting shot: Gratuitous Nose shot. Got Carrots? I could swear Cooper was giving you the stink eye... :) I feel for Gene - we have a volunteer fire department, too, with too few volunteers and those volunteers are an aging, hefty group. Alas, our shallow end of the gene pool feels that every day is Idiot Day. After your wild weekend, a morning ride was just what you needed!!! I wonder who enjoyed it more???? Are those towels on the Ziva David warp???? Nice!!! Michelle, He is a good boy. I'd like to say steady from ride to ride, but really, it's been year to year. We know each other so well. LA, Oh we both enjoyed it but for different reasons. 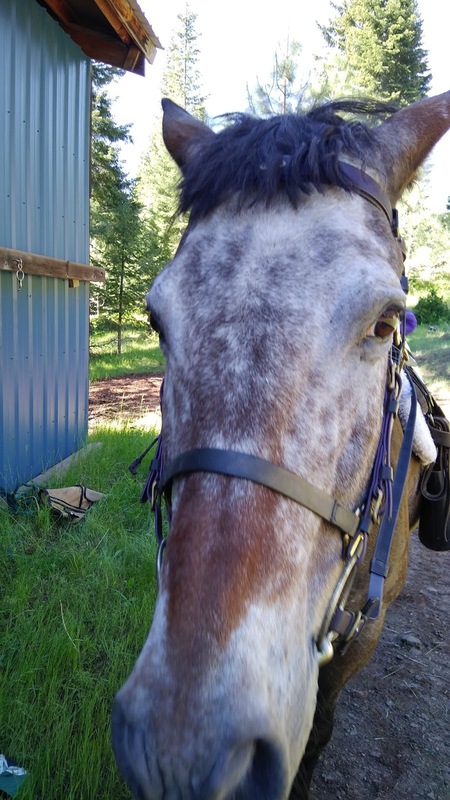 He got to have some grazing time and the grass is mighty green and tasty and far too rich for for grazing at will for dry lot horses. But a few minutes here and there are perfect. Well let's hope all the crazy's were out for Memorial Day and you get a peaceful 4th of July! Geez! You know, at my advanced age it still amazes me how UNcommon common sense is. These were fueled by alcohol, ensuring that there was virtually no conscious thought or decision making in the process. Your hubby is a gem to keep doing this amazing work. Peg, That's the truth! I use to camp often in Texas and for the life of me I can't figure out why anyone would want to wake up in the wild hung over. Idiots abound lately...we had the first rescue of hikers this year (ran out of water). 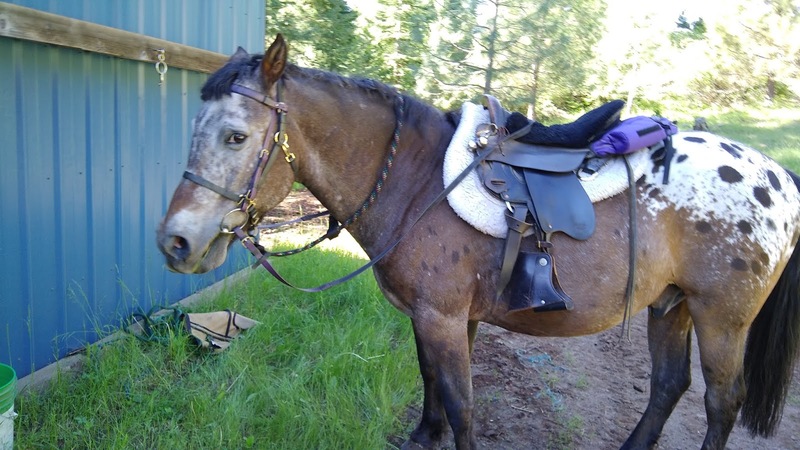 Cooper is looking very wise and content-glad you had a nice ride! Nick was a stinker this morning on the lunge line. I swear he knew I forgot to wear gloves.